During the holiday season, we think a lot about things that we enjoy, which of course means football and demographics. We present below a brief discussion on the history of NFL expansion and what it likely means for the future. First, let’s talk about the history of expansion. The real borders six months out of the year. In professional sports, one of the issues that we hear a lot regarding expansion is that “it dilutes the talent pool”. We hear that Babe Ruth had to face the top pitchers every day, and that in the 1950s NFL, the 32nd best quarterback never made a team, much less started. Actually, when viewed from the standpoint of a demographer, that whole premise is wrong. People always think about the number of teams and players when this discussion arises, but that’s only half the equation. The other half of the equation is the talent pool from which the team draws. If we have 32 football teams being created from a population of 1 million people, those teams won’t be as strong as if we have 32 teams being created from a population of 100 million people. So let’s look at the number of teams that we’ve had over time, and the population from which they drew their rosters. Let’s start on the two ends of the spectrum. In the 1920 season, the league that became the NFL fielded 13 teams. (Actually, 14 teams are in the records, but one team only played one game so I’m excluding them.) The population of the United States at that time was about 106 million, so each team drew from a population of about 8.2 million people. If you had 13 quarterbacks, they each represented the best player out of 8.2 million prospects. This means that each modern team are pulling from a slightly larger talent pool than its 1920 counterpart. In other words, it’s harder to make an NFL roster as a starter now than it was in 1920 when we had only 13 teams. Ostensibly, this means that the talent level is a bit higher. Let’s look at these ratios by decade. What we see is that the most competitive time to become an NFL starter was in 1940, when each team drew from a talent pool of 13.2 million. The easiest time to become an NFL starter was in 1970, when each team drew from a talent pool of 7.8 million. If we average the ratios over each decade, we end up with an average talent pool of 9.62 million people per team, which is almost exactly the current ratio. Therefore, the fact that we have 32 teams right now means that the league’s expansion has merely kept pace with long-term growth. They aren’t overexpanding and they aren’t underexpanding in terms of keeping the talent pool constant. But what does this mean for the future? Well, next week we will look at population projections and see if the NFL should add new teams as the population grows. Image credit: The image above is the work of Jared. 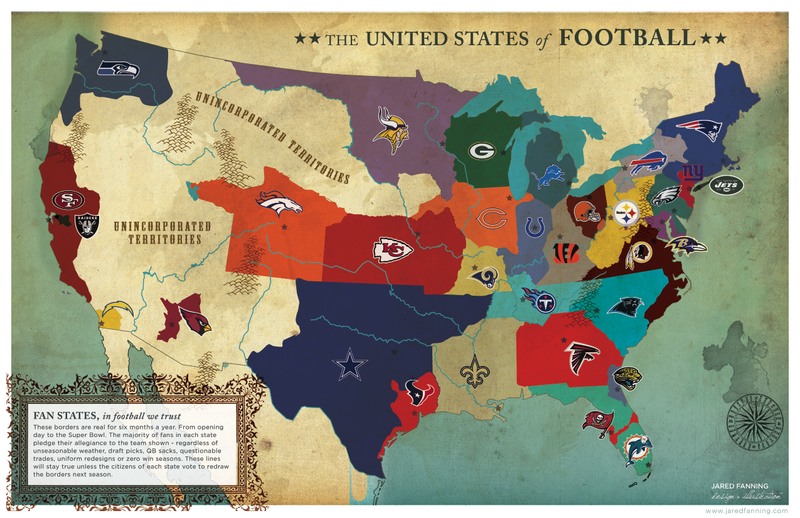 This was his first image in an ongoing series of plotting the United States based on a census of sports fans. Using the census data, he redraw state lines based on fan affiliations. Read the second piece of this blog series that answers the question: Where should the NFL expand?